The Angriest: Colditz: "Very Important Person"
It is 11 March 1974, and time for another episode of Colditz. With the tide of war firmly turned against Germany, orders are dispatched that the Waffen-SS will be placed in charge of all prisoners of war. All famous or well-connect prisoners, known as the Prominente, are to be transferred to Berlin to be used as hostages in the event that the war turns ever more against the Germans. When one of the American officers in Colditz is revealed to be the son of an ambassador, he is scheduled for transportation - leading to a tense stand-off between the prisoners and the guards. There is a sudden and stark shift in Colditz with this episode. The end of the war is suddenly in sight, leading to desperate measures by the Germans and the sudden realisation by the British and American prisoners that they may all wind up murdered by the SS before the war concludes. It plays out in the series' well-established understated style, and that makes the climactic stand-off all the more confrontational and tense. 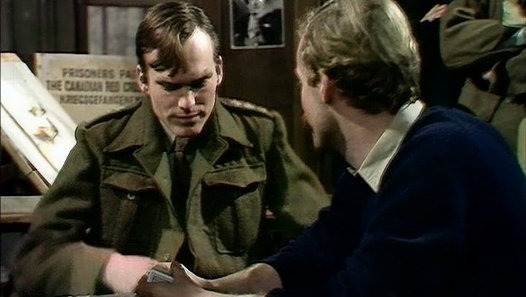 This is one of the episodes where all of the efforts by actor Bernard Hepton and the various writers to humanise the Kommandant pays off: he does not want to send the Prominente to the SS, because he knows it is a death sentence, tantamount to murder, and that obeying the order makes him complicit in the crime. At the same time he knows that disobeying the order will see him likely shot for insubordination, the camp taken over by the SS directly, and the entire prison population likely killed. Hepton plays the torment brilliantly. It is a sharp contrast to Anthony Valentine's odious Major Mohn, who - as a card-carrying Nazi - revels in the growing tension and threat to the prisoners. When the Kommandant is out of the camp it is Mohn who eggs on the situation to such a degree that the Kommandant returns to a near-firing squad of the British prisoners. It is a phenomenal scene, largely because the series has never reached this level of tension before. For a few minutes there it seems horrifyingly possible that half the cast are about to be slaughtered. This episode presents Colditz at its best: straightforward, intelligent drama with a strong historical backing and a wilful discipline that enables big-scale pay-offs like this. By episode's end the situation for the prisoners appears dire, but the situation for the German guards and officer seems almost as bad. It's a sharp, downhill run from here to the series finale.